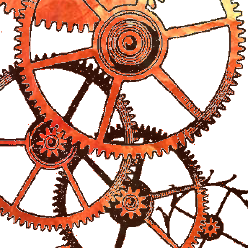 This is the result of little incremental changes, a bit like assembling a clock one gear at a time. It's only subject to its own fatality, to the point where some notes start appearing at random points in time (still within controlled limits). Guitars went through a home made tube distortion, drums are from an old-fashioned synthesised kit machined with Hydrogen and the notes with random rhythm twist and stereo pan were all synthesised by a piece of software called Splat; everything is only sine waves anyway. Instruments recording and final mix were made directly with a Fostex R8 reel-to-reel tape recorder.